Pro: Positivity by Barbara Fredrickson is endlessly fascinating. Fredrickson is a researcher who knows this topic in and out. She gives concrete targets for building positivity as well as proven strategies that will help you get there. Con: I found it difficult to identify all of my emotions throughout the day, and the book does not address research behind the idea that focusing on becoming positive can make you less so. I am a geek. I love these research types of books. I am mesmerized by the studies and evidence behind becoming more positive. 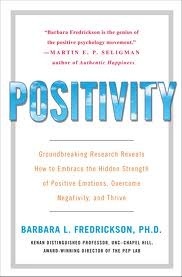 I appreciated Fredrickson’s approach to breakdown the benefits of becoming more positive and to give clinically proven ways to expand positivity in one’s own life. One of the most interesting things is that Fredrickson, along with a mathematical colleague of hers, identified a “positivity ratio.” They found that positivity really begins to impact one’s life when each negative emotion is countered by three positive emotions, a 3:1 positive to negative ratio. You can test your own ratio here: www.PositivityRatio.com. She asserts that most people hover around 2:1 and depression is typically present at a 1:1 ratio. The benefits of getting to the magical 3:1 line mean that your perspective and options in life broaden and your future begins to build. Hence, positivity begets more positivity. I believe most people inherently know this, but I was amazed that they could demonstrate this feeling in a scientific way, something attached to numbers. The book does recognize that being more positive does not mean that challenges magically disappear. It means that you are able to rebound easier from those challenges. The last section of the book is a “toolkit” to help increase one’s positivity ratio. It involves specific actions to take as well as mental exercises. Many have been explored by other authors, but I found it helpful to have a recapped list to refer back to. The part of the book that I struggled with was actually tracking my own daily positivity to see where I was at on the 3:1 spectrum. I found it hard to recall all of my emotions throughout the day and wasn’t sure if I was an accurate judge of just how positive or negative I was overall. There has also been some research which has shown that trying to become more positive in this way could be self-defeating. The more we focus on “am I happy now?” the less happy we feel because we tend to list all of the things that are evidence as to why we should not be happy, specifically the things we want and need. Fredrickson does concede that for someone at a 2:1 ratio, getting to 3:1, or higher, takes motivation and commitment equivalent to that needed by someone trying to lose a large amount of weight. If you have that drive, Positivity by Barbara Fredrickson gives you the goal and the action plan to get there.